There is always that fear when I hit the road. As a gluten-free (and vegetarian) athlete, grabbing food from a fast food joint just isn’t an option. And, let’s face it, some of the “safe” snacks at those convenience stores along the way are still a bit daunting when you’re on the road. All it takes is for one thing to not be right and you’re down for the count with some stomach issues. I wasn’t taking any chances this past weekend when I hit the road with my roomie, Cathy, and my good friend Jenn. While those two can eat pretty much anywhere and anything that sounds good…I had to watch it. I needed to be sure nothing I consumed would make me sick…or hit me wrong. So…now was as good a time as any to test out new protein bars, yes? Sometimes my logic is astounding, I know. 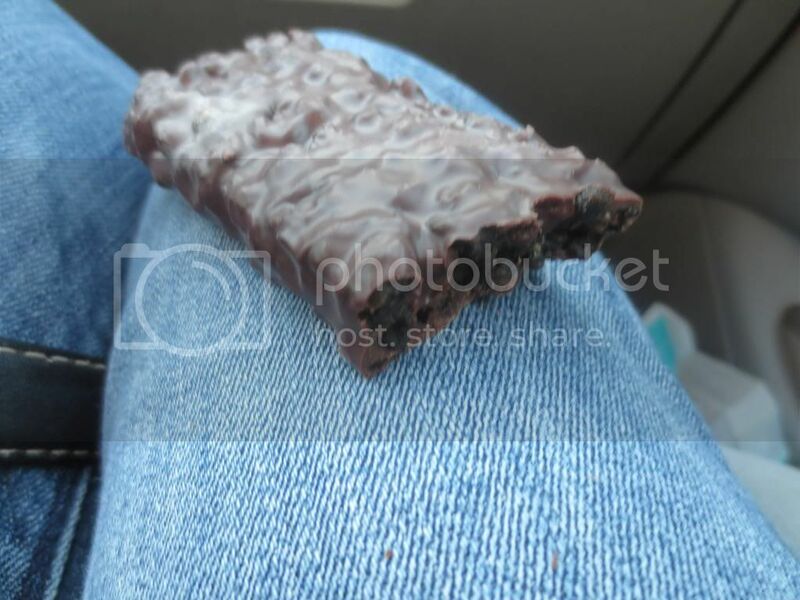 Anyway…I had packed from home two NuGo bars to eat on the road if needed. And thank goodness I did. We left Jenn’s house before the sun was even thinking about rising, having just eaten a few pieces of watermelon to at least get something in our stomachs until we stopped somewhere for food. That occurred shortly after putting gas in the gar, and getting some coffee from Starbucks. Cathy and Jenn were making noises about a quick drive thru at McDonalds. While milling about the convenience store that had the Starbucks attached, I spotted a few things of interest…Chobani yogurt, some fruit cups…but I said I would find something in the food I brought along. After all, that’s why I bring it along. So, we got our coffee (caffeine…finally!) and headed over for them to grab their breakfast orders. 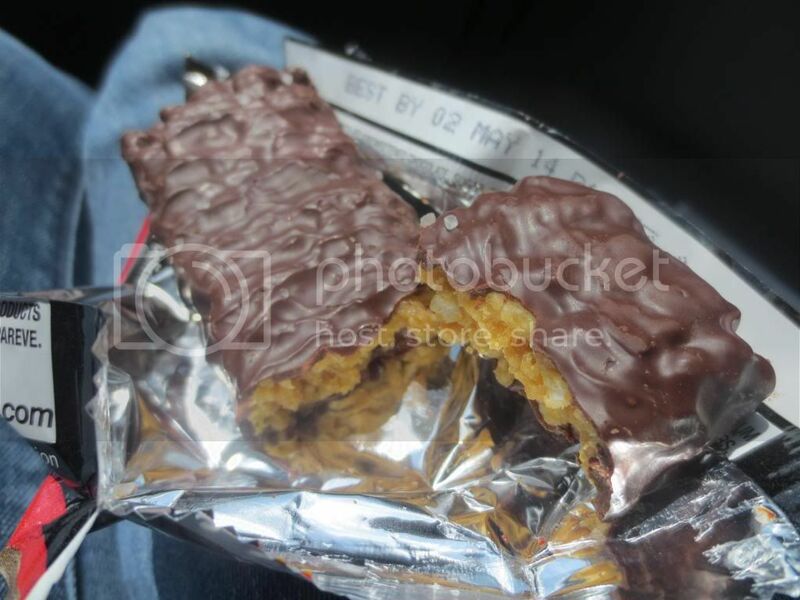 And as they noshed on their breakfast…I dug around in the little red duffel of snacks and good stuff and grabbed a small box of raisins and the NuGo Dark Mint Chocolate Chip Bar. 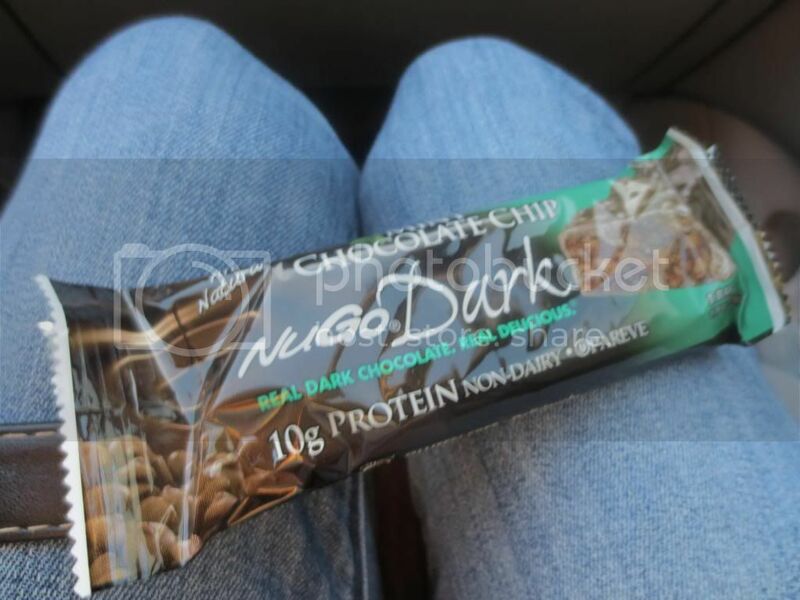 Now, I had previously had NuGo Dark Chocolate Trail Mix Bar while at an airport and starving. I loved it. I remember that much. So, I was having high hopes for this variety as well. And…come on…it’s dark chocolate and mint. That’s the most epic combination…anywhere. Who doesn’t like mint and chocolate? I unwrapped the bar and could immediately smell the hints of mint and that bittersweet aroma of (my favorite) dark chocolate! I broke off a piece and had to test it out…immediately. Remember Thin Mint Cookies? You know…those addictive little cookies that the Girl Scouts tempt you with every year? Well, they were my favorite back when I could eat them. And I’ve been without them for two years now. Two long years. Well, I can honestly say that the NuGo Dark Mint Chocolate Chip Bar reminds me of what a Thin Mint Cookie tasted like. Honestly. I think that’s why I somewhat hoovered and somewhat savored this bar. I went between wanting to devour it for sheer nostalgia and the fact that it tasted so damn good…to wanting to make each and every bite last. It was the only one I currently had, after all. This bar is sheer dark chocolate minty love in an easy to unwrap package. What’s even better…is that it is actually good for you. Let’s take a look at the nutrition. A serving size is one bar. This one bar will give you a hit of dark chocolate and mint at the cost of only 200 calories and 5 grams of fat. This one bar is cholesterol free and low in sodium (only 160 mg). You will receive 1 gram of fiber and 10 grams of protein. While the fiber count is low…the protein helps bulk it up and make it a filling choice for a bar. The sugar count is a bit high for my liking (14 grams), but it tastes like a Thin Mint Cookie…so…I’ll indulge a little this time. As far as ingredients go, it starts out with dark chocolate, soy crisps (which sort of gives it some texture and that crispness that gives it that Thin Mint Cookie crackle), tapioca syrup, agave syrup, chocolate rice crisp (more crispiness), soy protein, alkalized cocoa, brown rice flour, natural flavor, peppermint extract, and gum acacia. I’m familiar with the ingredients that these are made out of, putting my mind to ease about what I might actually be consuming. That’s always a nice relief. For a bar that tastes like you’re indulging in a sweet, dark chocolate treat…I highly recommend NuGo Dark Mint Chocolate Chip. Honestly…one of the best out on the market. Salty or sweet? Some people like one or the other. Me? I’m a fan of the combination. I love having that sweetness of chocolate (especially bittersweet dark chocolate) with something salty underneath. Before going gluten-free, chocolate covered pretzels were my kryptonite. Put them anywhere near me, and the entire bag would be gone in a blink of an eye. I can’t help myself when given something both salty and sweet. For me…it’s the perfect combination. So, on the way home on this road trip out to Utica, New York for an epic 15K road race (The Boilermaker), my lunch on-the-go (or on the way to ice cream) was the other NuGo bar that I packed from home. 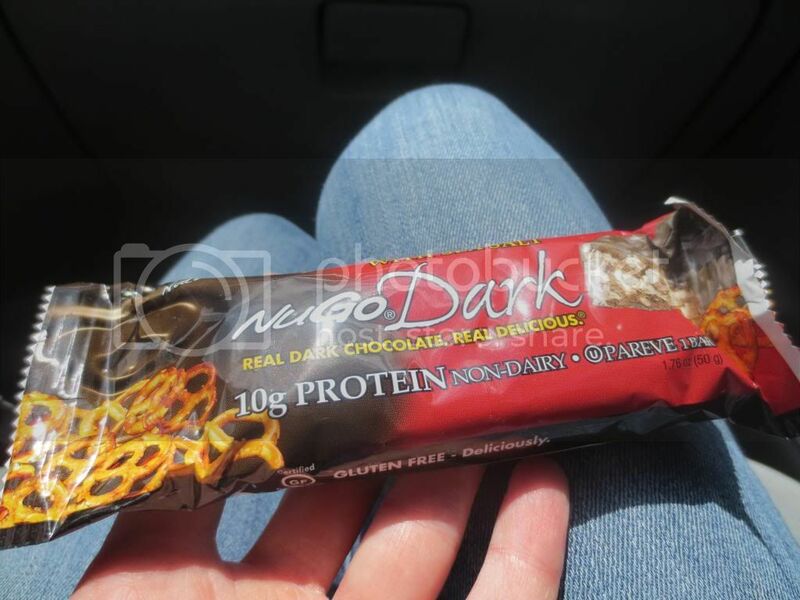 This time, it was the NuGo Dark Chocolate Pretzel with Sea Salt variety. Once again, I tore into the wrapper and unveiled a dark chocolate hugged bar. I could see the texture of the crisps that make up the body of the bar. And if the Mint Chocolate Chip variety was any indication of how epic this bar could be…I was already salivating. Once again, I broke off a piece and popped it into my mouth. I immediately got hit with the sweetness of the dark chocolate that completely coated this bar. The crispy texture from the crisps inside was perfect. And the combination worked. The crispiness of the crunchy pretzels sprinkled with sea salt and the bittersweet flavor of the chocolate just ignited my taste buds. Totally delicious. So, let’s talk nutrition on this one. One serving is an entire bar. YUM! This serving will serve you 200 calories and 5 grams of fat. Due to the inclusion of sea salt, the sodium count is only slightly higher (360 mg). This bar is still cholesterol free, however. Additionally, you get 2 grams of fiber and 10 grams of protein. Once again, the sugar count was a bit high for my liking (15 grams), but every now and again, it wouldn’t hurt to indulge a little in one of these bars. Trust me…this is definitely worth trying. While I didn’t like this one as much as the Dark Mint Chocolate Chip variety, this one was good for its own reasons and a bar I would certainly eat again. Both of these bars are not only low in fat and high in protein, but they are both also certified gluten-free, vegan, pareve, certified kosher, rich with antioxidants, healthy, and made with real dark chocolate. And both are super, super delicious!! If you are looking for a good protein bar that doesn’t taste like chemicals…these two flavors from NuGo are good options for anyone. I know they’ll find their way back into my pantry very soon. Try them…you’ll thank me later. This entry was posted in Breakfast, Chocolate, Food, Gluten-Free, Pretzels, Products, Protein Bar, Review, Snack Bar, Snacks, Sweet Stuff, Vegan, Vegetarian by The Celiathlete. Bookmark the permalink.